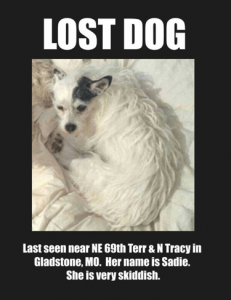 A few years ago, someone sent out a plea on Facebook begging for any help in finding her sister’s dog Sadie. A family member had been watching Sadie while the family was on vacation and she ran away. The family ended their vacation immediately and came back home to try to find their beloved dog. Soon the owner spotted Sadie in a creek bed and called out her name, but she ran. This was not a good sign as Sadie was now in what we call “flight mode”. She was already a very fearful dog and when a dog is gone for just even a few days they actually can become feral. There had been a few more sightings of Sadie. I followed the posts carefully, but every time I would get over to that area where she had been sighted, I couldn’t find her! It was posted that Sadie had been sighted crossing busy 72nd street, and I knew that is was best to trap her to keep her safe. The family sent out another plea asking for volunteers to meet up at the Gladstone Community Center. The goal for that day was to set 2 traps, post signs, and go door to door asking about Sadie’s whereabouts. One neighbor reported that she had spotted something going into the sewer drain. Could it be Sadie, I thought? The volunteers contacted Animal Control, but they were unequipped to remove the manhole cover. Feeling a little discouraged with that response we had no other choice but to proceed setting the traps in place. When I was down to my last flyer, a man offered to remove the manhole cover so we could see if indeed Sadie was in the sewer drain! My heart just skipped a beat as this was something we really wanted to see for ourselves, was Sadie in the sewer drain? I thought about Sadie often after the rescue, as I still couldn’t believe how that hot summer day ended so perfectly. A couple of days after she was found, we had a very heavy rainfall, and I know if Sadie had not been found that day the outcome would have been different. After being lost for 5 days, Sadie and her family were once again reunited and I felt we were all very blessed that day, with the strangers we met along this journey in helping with the rescue in getting Sadie back home. 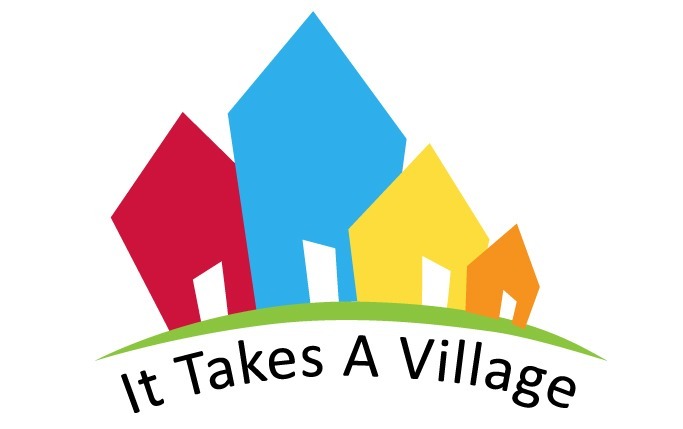 It takes a village!